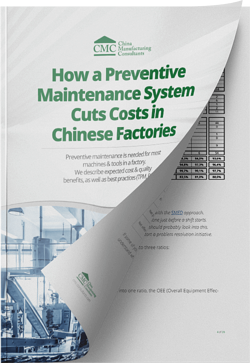 Preventive maintenance is needed for most machines & tools in a factory. In this guide you'll learn about expected cost & quality benefits, as well as best practices (TPM, RCM). In manufacturing operations, it is said that 15% to 40% of total costs are maintenance-related. If your factory utilizes machinery and tools, improving your maintenance practices is something you cannot ignore. Preventative maintenance is one of the 5 key success factors behind high-performing manufacturing operations. It has a direct impact on the total cost, quality, and delivery, in any factory that relies on machines and/or tooling. Keep reading, or skip to the section you prefer by hitting its link below. 1. Is your equipment working all the time? 2. Is Poor Maintenance Costing Your Company Money? 3. Is Poor Maintenance Causing Quality Issues? 4. What Are the Benefits of Preventive Maintenance? 9. What Is the Role of Maintenance in ‘Industry 4.0’? No time to read the entire page now? Download the free offline eBook! Download the pdf version of this page and read it any time at your leisure, just hit the button below. Let’s frame the question in another way. Have you ever visited a plant where all machines were available to work at the desired speed and the expected quality standard? Probably not, right? There are many reasons for equipment downtime. They usually categorized this way. If some of your machinery is expensive, you probably want to collect these data in detail, to understand where you lose the opportunity to make good products. Here is an example. There was no breakdown this week. Tool changes take time. There might be ways to address this with the SMED approach. Cleaning and inspection take a bit of time. See if it can be done just before a shift starts. Short stoppages at exit cause regular time loss. Someone should probably look into this. There are many products with holes! Someone should start a problem resolution initiative. And these three indicators are summarized into one ratio, the OEE (Overall Equipment Effectiveness). Many people doubt the OEE should be tracked, though. Its three components are meaningful, but the OEE is too synthetic (it includes numbers the manufacturing managers are not responsible for), and it can be gamed easily. If your operations use equipment, the response is very probably yes. The more complex and high-tech the equipment, the more you need good maintenance. Does it make sense to spend more on preventive activities? To a certain extent, yes it does make sense, especially for highly-automated operations. This was the case of the Dodge Durango plant in Newark, Delaware (note: this facility was managed by CMC partner David Collins). At the time, the average automotive paint shop was down (typically because of robots, conveyors, air flow, or ovens) about 15% of the time during normal operating hours. That’s a lot, in an industry that prides itself to be THE most efficient. In years 2, 3, and 4 of operations, the Dodge Durango plant had one of the highest preventive maintenance budgets of all plants in the Chrysler group and had zero downtime that impacted production for three years in a row. And what happens when things are not planned properly? The Hyundai plant of Montgomery, Alabama, which opened in 2005, is among the most highly automated automotive plants in the world. They reportedly had 20% downtime throughout the entire factory for an extended period, which significantly affected the production. A worn-out tool or a machine functioning abnormally creates unacceptable products that have to be reworked or scrapped. 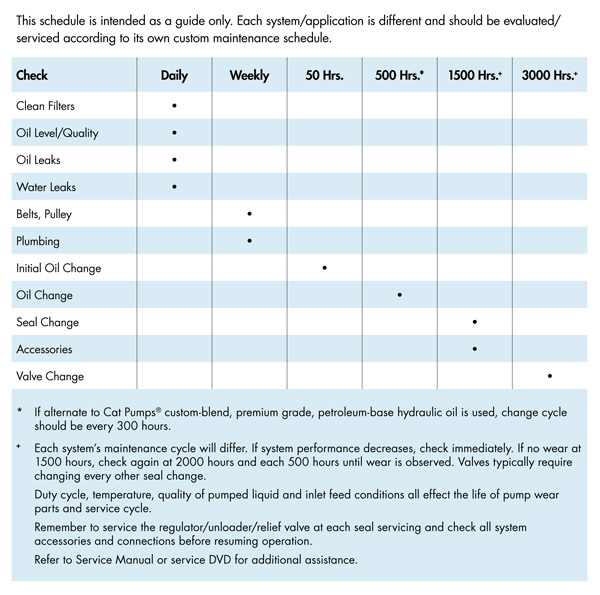 Poor quality often accompanies high equipment downtime. They are both indicative of insufficient maintenance. Let’s take a simple analogy. If the brake system on your car wears down and is not replaced in time (maintenance), what happens? The car is no longer able to stop as expected (quality). How does it play out in different processes? There are many ways a robot can create quality issues. It may lose some of its spatial integrity (ability to move precisely as expected) because a component got worn. The servo motor might not run as smoothly as it is supposed to. The tooling at the end of an arm might start to wear and might no longer be capable of completing its job properly. The list goes on. A CNC machine moves a tool along 3 bars (one for each axis). The machine’s ability to do its job as per specifications is compromised if the bars are not properly lubricated, or if the bars wear out (and get a bit thinner, allowing the tool to move around). A manufacturer believed their steel tool, which was cutting plastic, never had to be changed or sharpened simply because the plastic was so much softer than the tool. When we convinced them to change the tools, the plastic parts suddenly started to be within specification. Poor maintenance of the mold in a die casting process can generate too much flash (which means extensive rework of the parts and much scrap) and often pitting. SMT machines (in the electronics industry) need regular cleaning and adjustment. Otherwise, the throw rate (i.e. the proportion of scrapped components) is high, and it costs a lot of money. All these quality issues come from malfunctioning equipment, which was not taken good care of. As you will see in the sections below, most of these issues can be avoided at a much lower total cost. First, let’s quickly describe what the opposite of preventive maintenance is: Reactive maintenance (also called breakdown maintenance, or correction maintenance). I call it maintenance 1.0: ‘wait until it breaks before fixing/replacing it’. A pen is thrown away when out of ink and replaced by a new pen. A laser printer is replaced once it no longer works properly. However, for most production equipment, a more preventative approach is advised. Let’s run through the four main benefits of preventative maintenance. By letting the equipment run to failure less often, the organization saves a lot of money. Repair of an unplanned breakdown: 4 days down, 80,000 RMB of parts, much idle labor as well as overtime for some technicians, and 20,000 RMB of scrapped material processed just before the machine was stopped. Planned overhaul: The machine is stopped towards the end of a shift, 20,000 RMB of spare parts, no unplanned downtime and no bad surprises. Some unplanned breakdowns have a disproportionately high economic impact on the factory. Here are a few examples. A “monument” (a very costly piece of equipment with a special component such as a motor for which there is no spare part in stock) is down and prevents the whole factory from operating. In a pressure vessel, the locking mechanism or a valve breaks down, and a chemical reaction happens that causes very heavy losses. If the motor that keeps circulating the paint in an electrocoat tank shuts down for a certain time, the whole content of the tank has to be removed at considerable expenses, and all the material is lost. If a bearing shatters in a high-speed turbine system, an entire shaft might get bent. In the first days/weeks: they might have been poorly installed or poorly set, and operators poorly trained. This results in a higher failure rate. After that initial period: the failure rate is lower and appears somewhat random (e.g. a power surge damages an electrical system). After a particular time: some components are worn out and start to fail at an increasing rate. 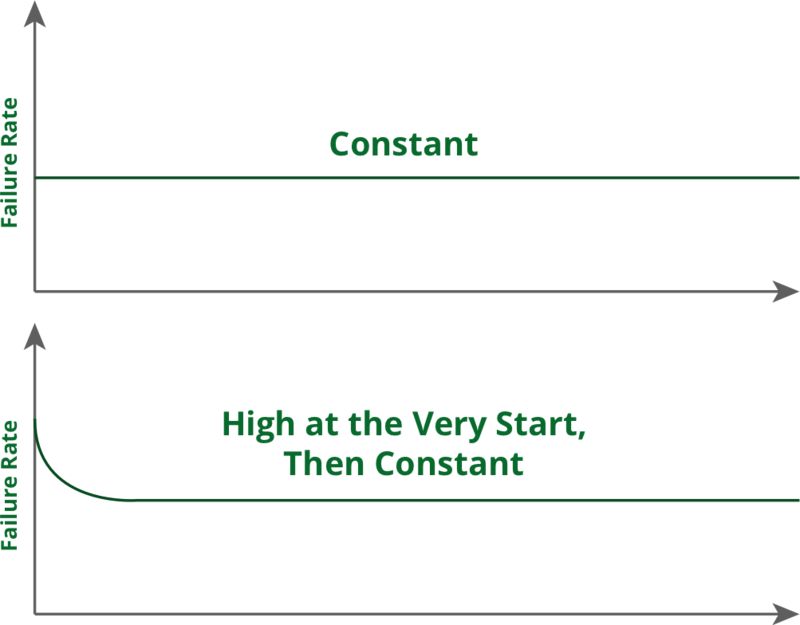 As a component or tool gets to stage 3, should you wait until it breaks down? In many cases, it makes sense to order spare parts and do the replacement at a convenient time. How to know what the right time is for replacements? Often, the equipment manufacturer can give an estimate for you to follow. (As you will see below, it might not be the best estimate in your situation). An automated machine that includes high-tech components is more likely to break down unexpectedly. The reason is, there are more single points of failure. There are ways to increase these system’s reliability (e.g. by adding redundant components), but it comes at an extra cost. For instance, the SMT process in electronic factories is a mature process that has been in use for decades. And yet, we noticed that 20-25% downtime is typical in Chinese plants. These are high-precision robots that place components on PCBs, and they need regular maintenance efforts. Looking into the future, as Chinese factories automate their processes use higher-tech machinery, they will have to switch to a more preventive approach. Just like your company probably has a zero-accident objective, and maybe also a zero-defect objective, it can aim for zero-breakdown. For that to happen, a more proactive approach is called for. Sometimes it also takes into account the age (e.g. time in operation or number of cycles performed) of the equipment. One good example is that of the oil change in a traditional car – typically “every 3,000 miles”. However, does it apply to all cars on the road? Not really. Some cars have to carry heavier loads, drive mountainous and dusty roads, have to put up with extremely hot conditions, and so forth. This one-size-fits-all approach can be discarded if the equipment condition can be monitored regularly. Let’s say you want your organization to start taking the preventive route for some of its equipment. Is it difficult to achieve this switch? In many factories, yes. There are two reasons for this. It takes discipline for the production manager to stick to the plan, rather than “make production now and worry about those risks later”. It also takes discipline to systematically document the actions, to show they are done on time as per the plan. Fortunately, with some of today’s inexpensive IT tools, this can be done nearly effortlessly. The good news is, for a factory that is setting up good process controls to maintain consistent quality, this is nearly no extra work. 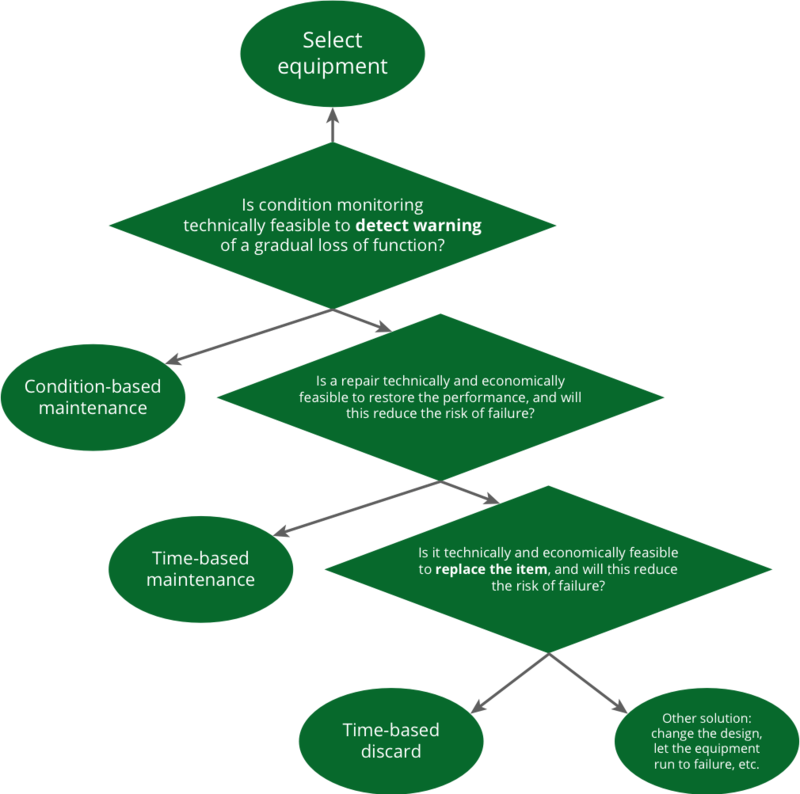 As explained in section 4 above, one single plan can guide preventative maintenance and process controls efforts. They can be merged for little extra workload. We see many manufacturers who have the machine supplier come in for a routine check every year. It sure doesn’t hurt. In the vast majority of cases, it is NOT adequate and sufficient. How to put in place a predictive maintenance (PdM) system? What are the priorities, to be implemented first? What equipment will impact your schedule and cost the most if it breaks down? Where do your most significant maintenance and spare part replacement costs come from? How to make sure you get closer to your objectives? Vaidya also suggests tracking both lagging indicators (e.g. the history of mean time between failures) and leading indicators (e.g. mean time to the first failure). Think of how to collect data on the condition of the machines or tools you designated as priorities in step 1. Based on the equipment to monitor, get the right devices and sensors to collect the information you will need (heat, vibration, oil contents, etc.). Also, think of where to store that information and how to analyze it. Don’t try to consume those “big data” right out of the firehose – you will need them to be presented in a certain way, or you will drown in information. Microsoft (Azure & Cortana), IBM (Operational Analytics), Amazon (AWS), and others offer solutions for this. Is ISO 55001 a well-thought-out standard? Sure. It is a good standard and will steer pretty much any manufacturing company in the right direction. As mentioned several times by now, there is considerable overlap between quality and maintenance. A company that has taken ISO 9001 very seriously is well on its way to being ISO 55001 compliant. Since this standard is meant to apply to any organization that has ‘assets’ to manage, it does not prescribe one specific approach. However, two best-in-class approaches are very effective at cutting total production costs. What are best-in-class approaches to maintenance? RCM (very powerful and yet relatively unknown), which is centered on the equipment. First, a few remarks about the use of ‘TPM’. There is a great deal of misuse and mix-up when it comes to this acronym. TPM originated in Japan, just like TQM (Total Quality Management) and TPS (Toyota Production System). They share many of the same principles, but they are not the same thing! Many people say “TPM” when they mean “a good maintenance system”. However, TPM is only a certain approach to maintenance. The next section covers 'Reliability-Centered Maintenance,' a complementary approach with different tools. 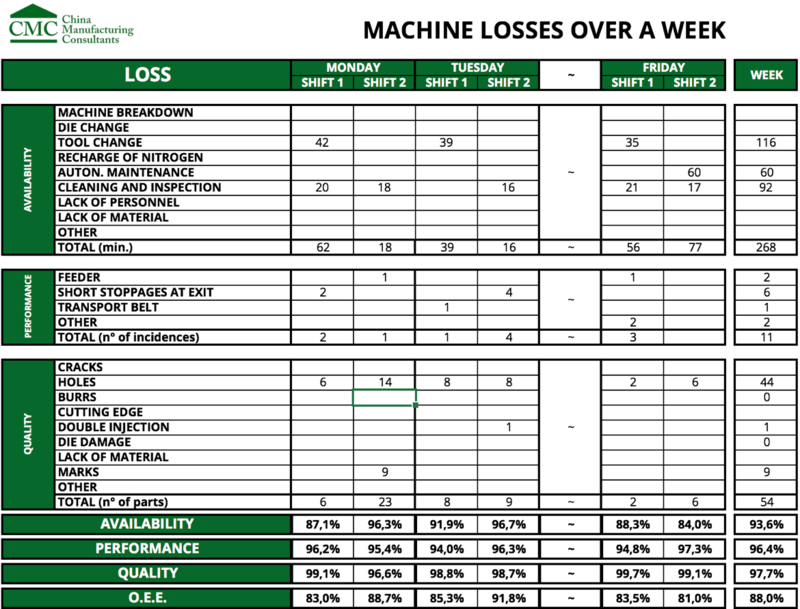 TPM is a company-wide program for improving equipment effectiveness—something maintenance alone could not do. When TPM came to America, we realized we probably made a mistake calling it Total Productive Maintenance. Probably should have been Total Productive Manufacturing. More precisely, the idea is to have everybody look after the equipment, clean it, report anything weird, do small adjustments, and so on. Much of the operators’ maintenance work is part of the 3rd S of 5S, and a good implementation of a 5S program also helps with quality and safety. The word ‘Total’ in TPM has these meanings: total effectiveness—pursuit of economic efficiency or profitability; total PM—maintenance prevention and activity to improve maintainability as well as preventive maintenance; and total participation—autonomous maintenance by operators and small group activities in every department at every level. What are the steps to put autonomous maintenance in place? Marc-Antoine Talva from Mobility Works suggests following these autonomous maintenance steps. Provide training to production operators, local leaders, and engineers. Initial cleaning & inspection by all involved parties – this can take a long time and should lead to identification of many signs of deterioration; the purpose is to restore the machine’s performance. Eliminating contamination and inaccessible areas – making sure deterioration can’t take place again by remove sources of dirt etc., as well as make it easy to access the parts of the machine that need regular cleaning and inspection. Develop standards for cleaning, lubrication and inspection – to make sure the good work can be kept up over time. Inspection and monitoring – looking out for issues on an ongoing basis and making small adjustments. 5S is a systematic process through which employees make space, set the tools, materials, and equipment in order (‘a place for everything and everything in its place’), and regularly clean & inspect the tools and equipment. We regularly guide manufacturing organizations through 2 or 3 cycles of 5S, for great results in terms of quality, cost, and safety. CLAIR stands for “clean, lubricate, adjust, inspect, minor repair”. In an organization implementing TPM, these are typically all handled by operators. There is considerable overlap between these two approaches. A good plan for 5S will include CLAIR in a factory that relies on machinery and tooling. 5S is a great basis for a TPM implementation. It helps give a purpose to the 5S efforts, which often meet great resistance and are always at risk of being abandoned. What about the specialized maintenance technicians? You might think if the operators handle most of the maintenance work, is there still a need for specialized staff in that department? First, remember that involving the operators in the cleaning and inspection brings superior results, simply because they are much more likely to detect an anomaly simply by being on site 8-10 hours a day. Second, major repairs/overhauls still need to be handled by specialized technicians. There might be a need for deep expertise, not only to do the job well but also for safety reasons. These specialists can also work on setting up reliability-centered maintenance (see section 8). Is there more than autonomous maintenance to TPM? However, the other pillars are seldom fully implemented. Factories that have not yet implemented TPM should start with pillar 1, it will take them time to do it well, and it will probably help them reap most of the benefits they can get from TPM. Based on our experience, it has been very difficult to find vocational help for handling maintenance and other technical jobs in Chinese factories. One challenge will be hiring, training, and retaining, the right types of specialists (in electrical, control, and/or mechanical systems) in a maintenance role. People with lower levels of education who haven’t been taught the technical skills necessary to work on production machinery and tooling. Another key issue we noticed is the managers’ reluctance to give training to the operators. It makes the implementation of TPM very difficult. Finally, and this is true in any country, specialists don’t want to train others to do what only they know how to do. It means they lose some of their ‘power’ and are no longer irreplaceable. A high-trust, low-threat environment makes the transition much easier. RCM is a very deep topic. Think of it as a central pillar of predictive maintenance (just like autonomous maintenance is the core pillar of most implementations of TPM). Its whole purpose is collecting data for making informed decisions. RCM typically involves heavy statistics, and there are software packages to help you with getting the most out of it. In this section, we will only touch on high-level concepts that managers of manufacturing operations need to understand. I already mentioned this type of data collection in section 1 above. Data also needs to be collected and recorded for each individual piece of equipment. As you can see, merging all these data together won’t make much sense because the patterns are so different. Each machine has to be considered individually. As mentioned in section 5 above, as a component or tool gets to stage 3 in the bathtub curve, it often makes sense to order spare parts and do the replacement without waiting for a breakdown. However, can we assume that the risk of breakdown truly increases past a certain time, or a certain number of cycles? If this applies to some of your equipment, is a “basic” preventive maintenance policy appropriate? Clearly not. Time in operation, number of cycles, or other time/age based measurements, do not help predict a breakdown. This is what United Airlines found out in the 1960s, as they tried to understand what drives the failure of some aircraft parts. A jet engine does not have a specific “lifetime” beyond which it becomes unreliable. What to do if “basic” preventative maintenance is not sufficient? First, if you can add redundancies (so that one component’s failure does not cause the whole system to fail) at a modest extra cost and weight, do it at the design stage. Third, if you can record historical data for each piece of equipment, you can also record its mean time to failure as well as other useful statistics. How to monitor the condition of your equipment? The idea behind condition monitoring is getting an early warning and reacting to a deviation from a standard before it leads to a breakdown. How to know what to look out for, when monitoring your equipment? You need to analyze the causes of past breakdowns. Hence the need to analyze those events on the spot and to record that analysis. Note that you don’t need to have a full history of each breakdown. Even if you only have past failure incidents data on 5 or 6 of these 20 machines, you can still rank them and run a Weibull analysis. Is there a way equipment design can be modified to improve reliability & maintainability? Let’s take an example. The maintainability of an iPhone is not very good. One has to bring it to a specialized store / service center for operations as simple as changing the battery. On the other hand, its reliability is very high and compensates (in the eyes of most users) for low maintainability. Both reliability & maintainability are strong cost drivers. These are the levers to act on, to cut total maintenance costs. Reliability theory (e.g. adding components in parallel for redundancy, adding a backup, etc.). Analysis of past data (most common failure modes and their root causes). Comments from users (e.g. accessing the filter is much work, there is a risk of electrical shock, etc.). Stress testing of a few prototypes (e.g. working constantly on high voltage, with high temperature and high humidity), finding their failure modes, and driving design iterations accordingly. Without maintenance, there can be no ‘Industry 4.0’. It is that simple. Higher-tech, more complex equipment has a higher number of failure modes. Without appropriate maintenance, it will be down often. At the same time, the number of inexpensive sensors all feeding a centralized database represents an opportunity for better decision making. Companies such as IBM, Bosch, Microsoft, and Amazon, are all developing analytical tools that aim at making sense of these data and presenting actionable insights. What some auto plants put in place in the 1990s is now available to hundreds of thousands of other factories. However, the reality in China is quite different. 2-3% of factories do a good job of this. And the vast majority is busy ‘putting out fires’ and haven’t set up a preventive plan. All these wonderful machines performed their intended functions, on test, but when they were put into operation in our plants, with our people, they were out of business so much of the time for this and that kind of failure that our overall costs, instead of going down, went up. No one had evaluated the overall probable failure rate and maintenance. As a result, we were continually caught with stoppages and with not enough space parts, or with none at all; and no provision for alternate production lines. China’s industrial sector is in motion. They are upgrading their processes and learning how to work with high-tech automation. They are going very fast. They are also switching to a preventive maintenance approach, but more slowly. We are not sure it will be sufficient to keep up with all the changes. Some people talk about “Maintenance 4.0”. In our understanding, it is composed of the basic preventive measures + autonomous maintenance (including good 5S) + reliability-centered maintenance (based on extensive and real-time condition monitoring). Naturally, all this only makes sense for some pieces of equipment – those supporting a claim of reaching “Industry 4.0”. Here at CMC we have seen this in only a few Chinese companies, mainly tier-1 suppliers of auto parts. Let’s see how fast it can spread in other verticals. Download the pdf version of this page and read it any time at your leisure. Just click the button below to get your copy for free. What Quality Inspection Software Is Ideal For Mechanical Products?